This week's Photo Of The Week is an interesting orphan photograph with several clues. I purchased the photograph in an antique store in Missoula, Montana. The staff had lovingly nicknamed the photograph "overstuffed baby," and you can see why. While I don't specifically collect photographs of babies, I was drawn to this particular baby, because of her eyes. They are beautiful and looking at them you must wonder just what color were they. While the photograph has been identified on the verso, a good detective will never assume that the information is correct. The information must be investigated. That is what follows with the analysis of "the overstuffed baby." (1) The card mount measures 5 in. X 7 in. and is 1.30mm thick. The photograph measures approximately 3 in. by 4 in. The corners of the card are rounded, the edges are beveled. The card stock is black morie silk, there is a raised embossed oval around the photograph. The back of the mount is a dark gray color with no photographic imprint. It is an exceptionally well done trim of the oval. The photograph is clear with excellent contrast and is perfectly centered. The photograph appears to be of very good quality. (2) The photographer’s imprint on the front (recto) of the photograph lists the photographer as O. L. Dowe, Artistic Fotografer. There is no address. (3) The back of the mount reads Dorothy Margaret Gray, Goldfield, Nev., October 13, 1907. There is no photographers imprint. The card is consistent with mounts of the 1900s in both size, thickness, board, bevel, and color. O. L. Dowe was Oscar L. Dowe. Dowe was active in Lovelock, Nevada, in 1891, 1901, 1904 and operated the Big tent below the Catholic Church" in Silver City, Nevada. From 1879-80 Dowe was a retoucher with Davidson Brothers in Portland, Oregon. Dowe operated as an itinerate photographer in California, Idaho, Nevada from 1890 - 1919. No fixed address is listed; several of the time periods list his studio as a tent. The Biographies of Western Photographers lists Dowe as Oscar S. The census and this imprint list Dowe as Oscar L.
The problem with this information is that we can not determine the exact location where the photograph was taken. While the back of the card indicates Goldfield, Nevada, biographies for Dowe do not indicated that he operated in Goldfield. During this period of time, 1907, Dowe is listed as operating his studio in a tent in and around Silver City, Nevada. The 1910 Census lists William Gray and his wife Emma living on East Elliott Street in Goldfield, Nevada with their two children, Dorothy age 2, and a son Gordon age 3 months. William works as a bookkeeper for a mining company. Gold was discovered at Goldfield in 1902, the year of the town's inception. By 1904 the Goldfield district produced about 800 tons of ore, valued at $2,300,000, 30% of the Nevada's production that year. This remarkable production caused Goldfield to grow rapidly, and it soon became the largest town in Nevada.Goldfield reached a peak population of about 30,000 people in 1906. In 1907 Goldfield became the county seat. In 1920 we find William Gordon Gray, his wife Mary Emma, and twelve year old daughter Dorothy living on University Street in Nye County Nevada in the Township of Tonapa . William is working as a pay teller in a bank. Missing from the Gray home is baby Gordon. Too young to have already left home since the last census, it can be assumed that baby Gordon has died sometime between the 1910 and 1920 census. On 18 and 19 April 1910, Dorothy is listed in the census as being two years old. That would make her date of birth between 18 and 19 April 1907 and 18 and 19 April 1908. The baby in the photograph only looks as if it is a few months old. 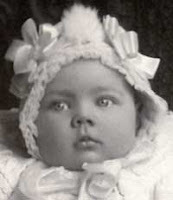 The birth date of 13 October 1907 would be consistent with the baby being approximately 6 months old at the time of the photograph. The satin and lace trim on the bonnet and cape, the embroidered shoes indicated that this was clothing for a special occassion, not clothing purchased for a studio portrait. The clothing would be consistent with christening outfits of the early 1900s. It has been determined that Dowe operated his photography business in numerous locations in California, Idaho, and Nevada from 1890 until 1919 as a traveling photographer. Although his biography does not indicate he had a studio in Goldfield in 1907, Goldfield was a Nevada boom town beginnng in 1906 and Dowe could have easily traveled there to take advantage of the newly rich miners, mine operators, their employees and their families. Therefore, the photograph could have been taken during 1907 or later, and the photograph could have been taken in Goldfield. In the alternative, we know that studio portraits were taken to mark a passage in the portrait sitter's life. Although the date listed on the back of the photograph is October 13, 1907, it may be the date of Dorothy's birth rather than the date the photograph was taken. 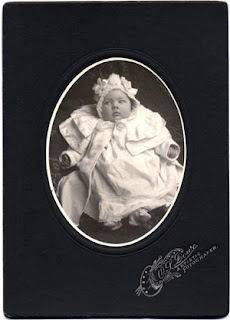 As such this may be a photograph of Dorothy's christening and the date would be around 13 April 1908. The clothing is consistent with christening outfits of the early 1900s. Both William and Mary Emma are of Irish descent. If their religion is Catholic, they might have traveled to Silver City to the Catholic Church to have Dorothy christened. Just down from the church in Silver City was Dowe's tent. The Grays may have gone directly from church to the tent for a photograph to commenorate the event. 1900 U.S. census, Inyo County, California, population schedule, 1-Twp, p. 2, dwelling 48, family 48, O. L. Dowe (Head); digital images. Heritage Quest (http://persi.heritagequestonline.com/ : retrieved 2 May 2008); citing NARA microfilm publication T623, roll 87. Occupation - photographer. 1910 U.S. census, Esmeralda County, Nevada, population schedule, Goldfield, p. 82, dwelling 99, family 100, William Gray (Head); digital images. Heritage Quest (http://persi.heritagequestonline.com/ : retrieved 2 May 2008); citing NARA microfilm publication T624, roll 858. 1920 U.S. census, Nye County, Nevada, population schedule, Tonopah, p. 84, dwelling 369 , family 374, William Gordon Gray (Head); digital images. Heritage Quest (http://persi.heritagequestonline.com/ : retrieved 2 May 2008); citing NARA microfilm publication T625, roll 1005. Maven, Another wonderful photograph and in-depth analysis. Most interesting --- and I'm betting that you get this orphan photo home too! From your keyboard to God's computer screen. 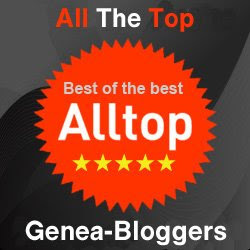 I think that the Photo of the Week is my favorite series on this blog (though I look forward to them all) - this is just brilliant, as always! I really enjoyed reading about the "Overstuffed Baby" - she is really adorable! I wonder just how many layers she had on? Thank you for sharing what you know about O. L. Dowe. I just received a photo of my great-grandmother as a young child around 1900. "O.L. Dowe, Artistic Photographer" is written on the bottom.